When Addie Bowden was diagnosed with autism at nearly 3 years old, she still didn't speak and sometimes didn't recognize family members. She would slap herself repeatedly on the forehead and scream, trying to communicate her wants and needs. When Addie Bowden was diagnosed with autism at nearly 3 years old, she still didn’t speak and sometimes didn’t recognize family members. She would slap herself repeatedly on the forehead and scream, trying to communicate her wants and needs. 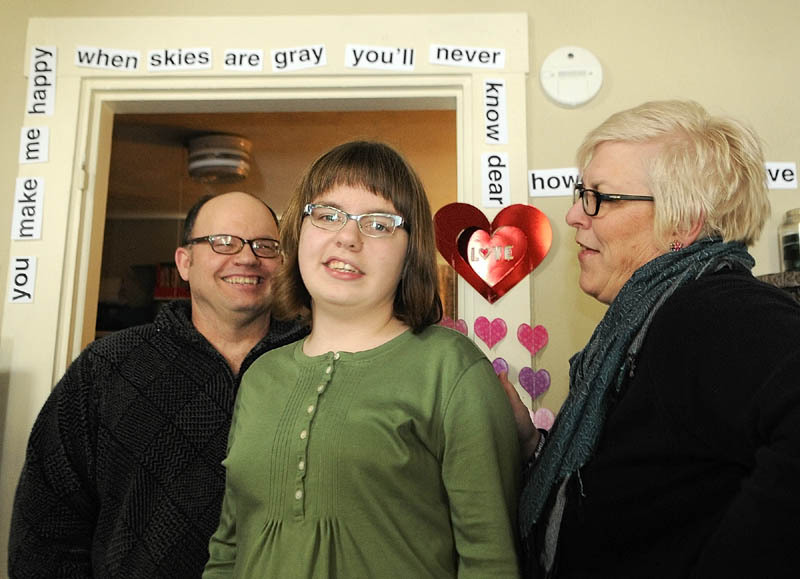 A decade later, Addie is an eighth-grader at Cony Middle School in Augusta, where she recently won the Spanish Student Award for her outstanding vocabulary skills. She also plays the baritone horn in the school band and she’s earned a blue belt in karate. Addie’s mother, Heidi Bowden, executive director of the Maine Autism Alliance, credits her daughter’s success to various intensive, evidence-based therapies that Addie has received almost daily since she was diagnosed. Now a bill in the Maine Legislature would help more families access the specialized speech, language, occupational and physical therapies that Addie receives, known as Applied Behavior Analysis, as well as other professional developmental services. Maine joined a national trend in 2010 when it passed legislation requiring private health insurance companies to provide coverage for autism spectrum disorders in children through age 5. The bill before the Insurance and Financial Services Committee would push the coverage requirement to age 21. Proponents say the bill is intended to ensure a continuum of care for children who have autism but aren’t covered by MaineCare, the state’s form of Medicaid, and who may live in school districts where autism programs are limited. “When you look at the range and variety of individual circumstances of people who have autism in Maine, we have children and young adults who can only get so much through our public schools,” said Sen. Emily Cain, D-Orono, one of the bill’s sponsors. The insurance committee has yet to schedule a hearing on the bill. About 2,800 Mainers have autism, a developmental disorder that usually appears in the first three years of life and affects the brain’s normal development of social and communication skills. Thirty-four states require private insurance companies to provide some level of coverage for autism spectrum disorders. It’s part of a larger effort to recognize behavioral and mental health care as important and related aspects of overall health care. Maine is one of 17 states that passed autism coverage laws after the federal Affordable Care Act was enacted in March 2010. The act recognizes behavioral health care as an essential health benefit. The Maine Association of Health Plans, which is made up of four health insurance companies operation in the state — Aetna, Anthem BlueCross BlueShield, Cigna and Harvard Pilgrim Health Care — opposed autism coverage when it was before the Legislature in 2010. That bill initially called for coverage to age 21, but it was amended to age 5. A study at the time showed that providing coverage for autism spectrum disorders would increase monthly insurance premiums $2 per person statewide, said Katherine Pelletreau, executive director of the health plan association. The association has yet to take a formal position on the new bill, Pelletreau said, but it probably will oppose it. Expanding autism coverage could be costly for the state, she said, because it would have to subsidize health plans purchased by low-income Mainers that include benefits mandated after 2011. The plans will be sold through a federal exchange starting next year. Pelletreau also noted that the Maine legislation may conflict with federal law because it caps autism coverage at $36,000 per year per child, something that the ACA won’t allow. Providing appropriate, consistent developmental therapies can cost more than $50,000 a year, said Bowden, head of the Maine Autism Alliance. She got special training so she could provide therapy for Addie on a daily basis. For parents whose insurance doesn’t cover autism after age 5, many pay out of pocket and risk going into debt to get their children the therapies they need, Bowden said.